The 2019 Volkswagen Jetta is entirely new. The “V” in VW can quite appropriately refer to the VALUE in the new Jetta when it comes to this revamped entry in the compact sedan segment. 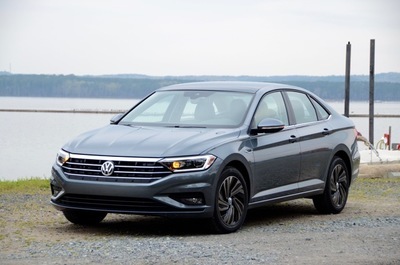 Pricing for the new 2019 Jetta starts at $18,545 for the S trim with a manual transmission. The sales-volume trim is forecasted to be the SE, priced at $22,155. That’s $90 lower than the outgoing 2018 model. However, more content and new features have been added that yields overall added value of $1,010. The Jetta has been around since 1979. It’s been the big-sellng model for VW in the U.S. with more than 3.2 million sold since 1980. This redesign is now the seventh generation of the Jetta. 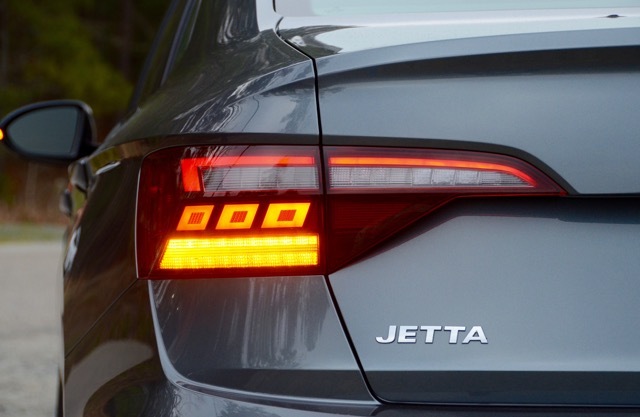 Jetta is now built on VW’s MQB architecture. That’s the same as the present-day Golf and is also the same architecture as the Atlas and Tiguan. 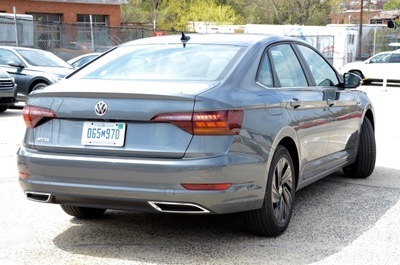 Compared to the outgoing Jetta, the new Jetta has a 1.3 inches longer wheelbase, a wider track, 1.7 inches more overall length and 0.8 inches increased height. More headroom and more shoulder room, in spite of a touch less legroom, now make for a more comfortable cabin. Rear seat space is quite good, even for tall folk. The 4-door Jetta is more stylish and has a new coupe-like exterior design. VW says customer desire drove this design approach. Noticeably different from the past Jetta are the rear-quarter windows that reduce the mass of the C-pillar. I like the proportions of the new Jetta; the true telling is when you see it on the road. The muscular look, the side character or tornado line and the roof slope into the trunk all give the Jetta a nice presence on the road. LED lights front and rear are standard on all trims as are alloy wheels. The R-Line has black trim bits, fog lights, a unique rear bumper and dual exhausts. The Jetta will be offered in five trims. The previously mentioned S and SE as well as R-Line, SEL and SEL Premium. All trims are powered by a 147-HP 1.4-L turbo that produces 187 lb-ft of torque. An 8-speed automatic drives the front wheels on all trims. A 6-speed manual is offered only on the S trim. VW did its homework when it comes to low fuel consumption. EPA test-cycle ratings are 34 mpg combined, with 30 city mpg and 40 highway mpg. An idle stop/start system is standard on automatics. On my test drive in moderate climate with a mix of urban and highway roads we were getting around 36 mpg. A complete array of driver-assistance safety features is available including forward collision warning with autonomous braking, blind spot monitor, adaptive cruise control, lane keep assist and high beam light control. A rearview camera is standard on all trims. My recommendation is to opt for all the driver tech you can get. The cabin layout provides a high seating position and good overall outward sight-lines. 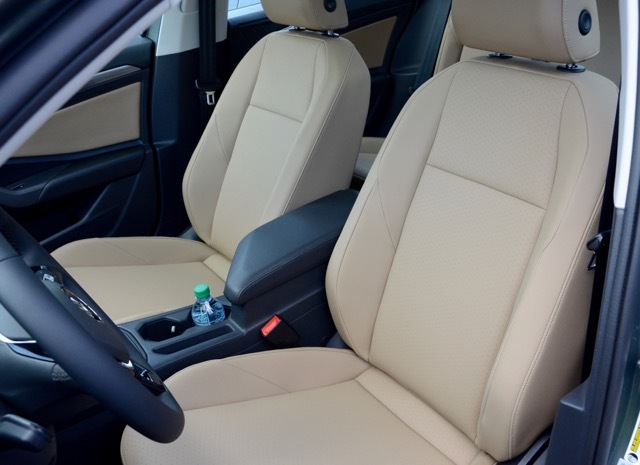 The S trim has cloth seats and the top line SEL Premium has leather, with the others getting leatherette coverings. There’s good interior storage with a large center console bin as well as deep door pockets. The well-designed instrument panel has a 6.5-inch touchscreen, and there’s also an optional 8-inch screen. SEL and SEL Premium trims have a 10.25-inch digital cockpit reconfigurable instrument-panel screen. 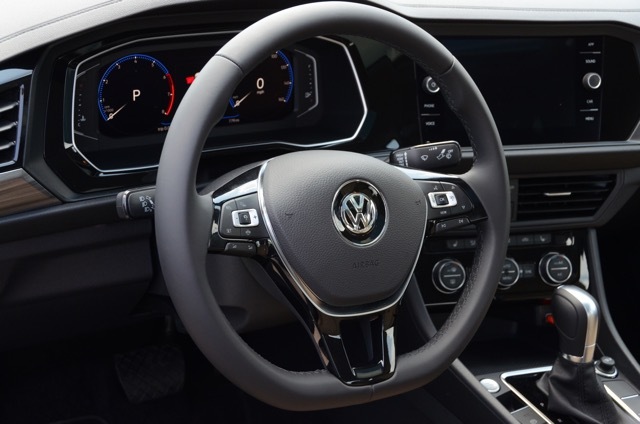 Apple CarPlay and Android Auto are standard, as is VW’s Car-Net connectivity system. An optional 400-watt Beats 8-speaker audio system is aimed squarely at young(er) buyers. The trunk holds 14.1 cu.ft., which is a bit smaller than the outgoing Jetta but still plenty roomy. A 60/40 split-folding rear seat is standard. The 1.4-L turbo, the only engine available for now, and the 8-speed automatic work well together. Response from stop is quite good and mid-range acceleration and passing does not leave you hanging. I didn’t get to drive the manual. But in today’s world of better performing automatics combined with ever increasing traffic congestion perhaps that’s not so critical. Overall, the Jetta’s ride, handling, braking and powertrain performance is very well balanced and delivers a very satisfying drive experience. The MQB architecture is key in making this happen. The suspension has good compliance with a firm ride yielding confident handling. The fun-to-drive component is high, as is typical of VWs. 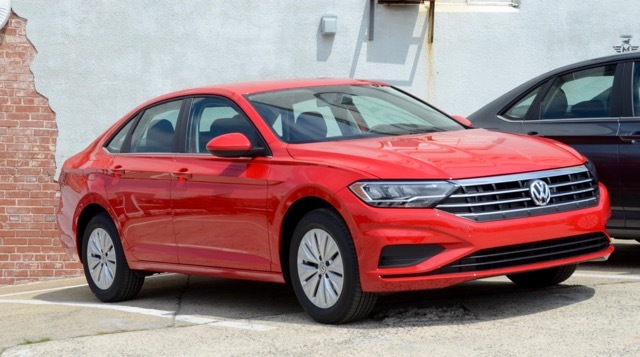 The longer wheelbase and wider track of the new Jetta compared to the outgoing model provides for a more comfortable and refined ride. The new 2019 Jetta is on sale this spring. More information, specs and details can be found at www.vw.com. Not to be overlooked is VW’s 6-year/72,000 mile warranty, claiming to be the best-in-class, and it’s also transferable to future owners. In this world of everyone wanting an SUV, rightly or wrongly, traditional 3-box sedans still have a place in the market. The new Jetta is now a much more viable consideration in the compact segment, especially against some of the mainstream entries. Pickups may be king in the U.S., but you can still sell cars by offering good value and sound pricing. Oh, and don’t take your eye off gasoline prices.